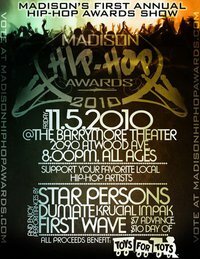 The First Annual Madison Hip-Hop Awards took place at the Barrymore Theater on Friday, November 5th. The crowd was estimated at nearly 300 but the enthusiasm and excitement filled the house. The advance buzz on this event was practically nil. Efforts to promote it where restricted to online resources, word-of-mouth and the promotional efforts of 93.1 The Jamz. The post-reporting has been even less, demonstrating how completely out-of-touch the mainstream music reporting has become on the subject of local hip-hop music. There were approximately 100 nominees who were chosen by a nominee committee. Awards were presented in eighteen different categories. Performers included Star Persons, Krucial Impak, dumate and members of First Wave. But the real winner was Madison hip-hop itself. Though there are sure to be those who would criticize the organizers of the event for earning nominations (particularly L.O.S.T. S.O.U.L.S. and Top of the Map Entertainment), there were no visible problems with any of the presentations. Besides, somebody had to get this thing started and they certainly deserve props for doing so. The vibe was so overwhelmingly positive that it made this event a pure joy to attend. Like the Madison Area Music Awards (which represents nearly twenty genres of music in the Madison area including hip-hop), the Hip-Hop Awards were set up as a benefit, in this case, Toys for Tots. Speculation was no-doubt made about the Hip-Hop Awards being a reaction to the MAMAs but the truth is that the MAMAs consulted with the organizers from the start, offering advice and even assisting in setting up a similar online voting system. The two organizations are hopeful that together, more recognition can be given to Madison-area hip-hop artists and that ultimately, they work in concert to serve the community, both in an artistic sense and a charitable sense. Hip-Hop Group of the Year: L.O.S.T. S.O.U.L.S. Rick: Thanks again for continuing to support Madison Hip-Hop. Your presence at the event was crucial. Insofar as the those who won the awards are concerned, they were chosen by popular vote via an online system provided by Broadjam (Broadjam also analysed the numbers, the MHHA committee did not). All email addresses and IP addresses were tracked, so cheating/bias from the committee were non-issues. That being said, the winners of the awards, myself included, must feel all the more grateful that so many members of the Madison community took the time to select them in their respective categories. I’m glad the show was a success! It was a great feeling to see the solidarity in the communit and I can only look forward to future eandeavors. Great write up and thanks for linking my gallery! Thanks for this write up! We really appreciate all your support surrounding the event. I just want to note that all awards were open to self-submission for about six weeks this summer. The nominations committee simply organized these entries into nominations categories. It was truly a humbling experience to see so many show up to support and participate in this event. It is also notable, considering the bad reputation Hip-Hop sometimes has, that this event had a peaceful yet exciting and enjoyable atmosphere. We would love to see anyone with a love for Hip-Hop get involved for next year. Check back after the first of the year at madisonhiphopawards.com and the Madison Hip Hop Awards Facebook group for info on when organizational meetings will begin again. Email madisonhiphopawards@gmail.com for more info, questions, concerns. A very big thank you to Karen Reece also, who deserves to be mentioned by name. She was the one who the buck always stopped with. Her support not only of this event but the community at large has been noteworthy. She, along with the other organizers, gave a lot of their time and effort and the result was wonderful. Goosebumps, It takes time for big things to happen. I was happy to be a nominee on the same panel as other great Madison Midwest talent, everybody is interconnected so in this case we all won when it comes to HipHop in Madison. Till next year! Midwest Stand Up! Lets Go!